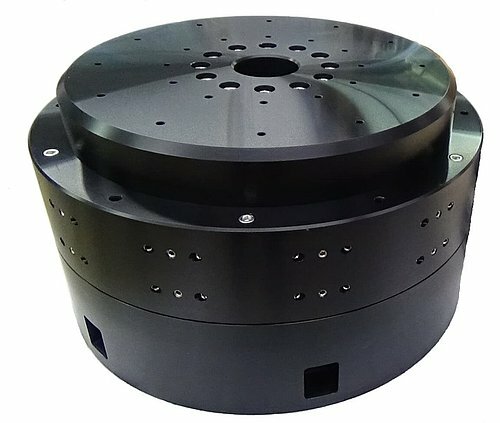 PI recently built a large 300mm diameter rotary air bearing stage for use in a synchrotron beamline test facility. The beamline, when finished, will be used for Macromolecular Crystallography. The application required very high tilt stiffness due to a shifting center of gravity in the payload; therefore a large bearing size was selected. The moving mass is less than 5kg and the tilt error motion had to be less than 0.33 µrad. The required tilt stiffness was therefore at least 9 Nm/µrad. The stage was designed with a slotless brushless direct drive servo motor. Slotless motors offer very low cogging forces, enabling smooth velocity and low error motions. Since this application did not need high speed or acceleration, a slotless motor was an optimal design choice. The stage includes an optical rotary encoder with a digital TTL output signal. After 400x interpolation, the resolution of one encoder count = 0.07 arc-sec (0.33 µrad). 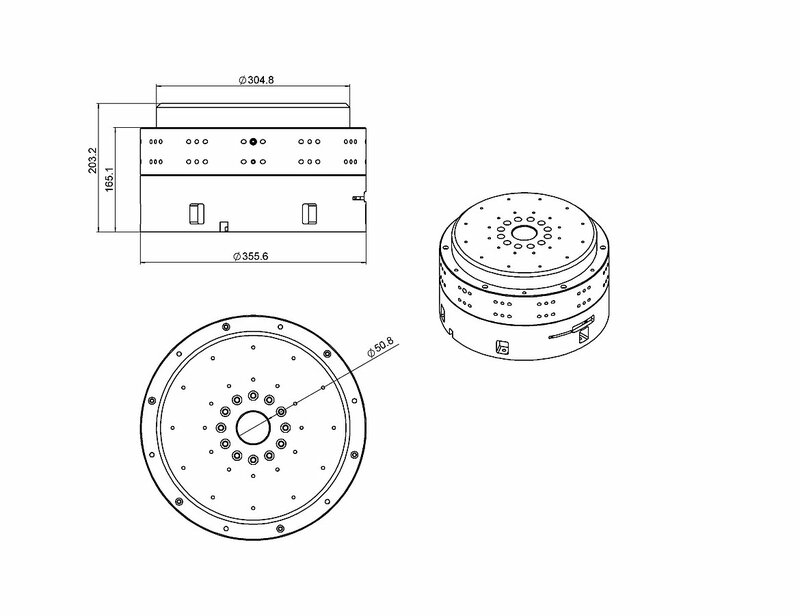 Very fine encoder resolution is necessary to enable smooth velocity control by the servo system. Final velocity performance will be verified by the customer in their installation. Stiffness measurements were taken by loading the bearing in different orientations and measuring displacement. The stage was designed to carry up to 500 kg axial load, and up to 125 kg radial load. In this application, the load was axial. Of utmost importance to this application was the very low error motion of the air bearing. Measurements were taken using a master ball and a capacitance probe. The master ball was mounted 50mm above the air bearing tabletop. Total radial runout error motion measured was less than +/-25 nanometers. Figure 2 Radial Runout Error Motion Graph 50mm above table. Red line: perfect circle with no error; blue line: actual error (in microns). The dashed lines represent the max/min error bands around the perfect circle (+/- 25 nm). The master ball was then mounted 100mm from the table surface. Radial runout error motion measured was less than +/-35 nanometers. Wobble error motion is calculated to be +/-0.2 µrad (+/- 0.04 arc-sec). Figure 3 Radial Runout Error Motion Graph 100mm above table. Red line: perfect circle with no error; blue line: actual error (in microns). The dashed lines represent the max/min error bands around the perfect circle (+/- 35 nm). Contact us today at air@pi-usa.us to discuss how we can solve your precision motion challenge.